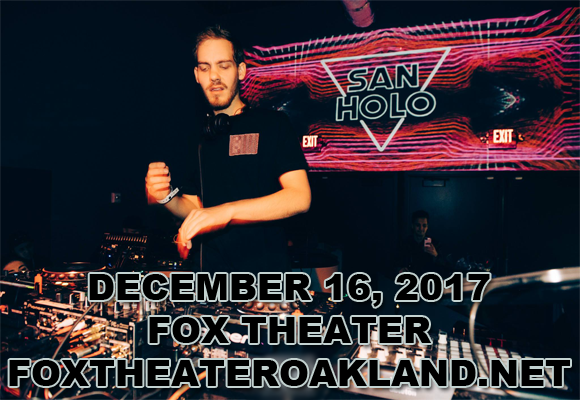 Dutch DJ San Holo is making huge waves in the EDM and trap game, and now he's heading to Fox Theater Oakland on Saturday 2nd December 2017 with bitbird labelmates Droeloe and Just A Gent as part of phase one of his fall tour! King of the rave, San Holo won't need to use his Jedi mind tricks to get you dancing all night long – it's gonna be one hell of a party! Dutch DJ, composer, musician and record producer San Holo first gained widespread recognition with his 2014 remix of Dr Dre's “The Next Episode,” which has since had over 140 million views on YouTube. San Holo was first signed to Heroic Records in 2013, and has since released music on several record labels including Spinnin' Records, OWSLA, Barong Family, and Monstercat, as well as founding the label bitbird, which has released several of his singles including "Still Looking" and "Light."